SHELVES in popular book stores can be undiscerning little buggers, as can the book stores themselves. For example, I recently had cause to wander through the tightly-bound and bulging aisles of my local Dymocks book store. They have some really quite “special” offerings both online and in-store. Even though we essentially know that astrology is, for all intents and purposes, basically b******s, I can report that the paperback version of “Practical Astrology” is “in stock”. Failing that, there’s also “Homeopathy for your Cat” within the pages of which you can find out how magic water can cure your ginger’s urinary tract issue. Are you a book shopping parent who has “wished for a handbook on each child”? Well tough, because Dymocks has sold out of “Homeopathy and Your Child” so you’ll have to work out your kid’s “physical, mental, emotional and spiritual needs” some other way (by the way, I’m not singling out Dymocks here – most of the big high street book sellers also hawk similar enlightenment-crushing garbage). And there are the books on climate change. Without any prior knowledge, it’s easy to see how the average punter might be easily fooled by the line-up of books cosying-up in Dymocks and elsewhere. As you can see by the image above, there’s some excellent stuff on offer from well credentialed authors and scientists. There’s What We Know About Climate Change by MIT Professor of Atmospheric Science Kerry Emanuel. Just beneath, is The Hockey Stick and the Climate Wars: Dispatches from the front lines from Professor Michael Mann, director of Earth System Science at Penn State University, also in the US. And sharing the same shelf space, is Taxing Air written by Dr Bob Carter, an Australian geologist and advisor to about a dozen climate science denial organisations around the world, and John Spooner, a cartoonist for The Age newspaper in Melbourne, Australia. Bob Carter’s fringe views on climate change (it’s all natural) make him a favourite of fossil fuel-funded propaganda unit the Heartland Institute and many, many other groups with similarly dismissive views on human-caused climate change and its risks. Carter was recently let go by James Cook University in Queensland, where he had been an unpaid adjunct professor for over a decade, because he wasn’t pulling his weight. Carter hinted – and his supporters screamed – that he had been booted out because he was a climate sceptic. I covered that case for DeSmogBlog and also summarised this and other recent goings on for the ABC Science Show. But back to Taxing Air, which is yet another climate sceptic book with strong links to a conservative “think tank” – in this case, the Institute for Public Affairs, where Dr Carter is the Science Policy Advisor. The IPA paid for copies to be sent out to Australian members of parliament and has also hosted a launch event for the book. Research has found that almost four out of five climate sceptic books published since the early 80s have links to conservative think tanks. Dr Carter, it should be noted, has only written one scientific paper on atmospheric climate change, which claimed – wrongly as it turned out – to have found that recent global warming was down to natural cycles of water temperatures in the Pacific. One group of leading climate scientists who analysed carter’s paper concluded that the conclusions he and his co-authors drew were “not supported by their analysis or any physical theory presented in their paper”. But is Taxing Air any good? Well, I have a copy which I’m still trudging through (I may not get to the end). But one academic who has finished it is Australian Ian Enting, and he is none too impressed. Mathematical physicist Enting (author of the Australian Mathematical Scences Institute book Twisted: The distorted mathematics of greenhouse denial) worked at Australia’s leading science agency, the CSIRO, for 24 years in atmospheric research and modelling of the global carbon cycle. Enting has analysed the book, describing it as a “polemic” characterised by “half-truths and slanted misrepresentation” and “appalling hypocrisy”. At one point, Enting’s document notes how one chart in Taxing Air is taken from a leaked draft of the not-yet-published United Nations IPCC Assessment Report 5 (due out in two weeks). hows how climate models agree with the observations within the range of uncertainty. Enting finds dozens of other examples like this. But my real reason for going into the Brisbane Dymocks store was to hunt out a copy of Killing the Earth To Save It, written by UK-based climate science denialist and wind-farm hater James Delingpole. In the UK, it was published under the name Watermelons. There was something remarkable about the book which I had read and was keen to confirm. The book was published by Connor Court, which has published several other climate sceptic books. The editorial board of Connor Court also includes the IPA executive director John Roskam. The IPA also paid for Delingpole to tour Australia to promote his book in September 2012 – a favour which he returned by running a public appeal for people to donate cash to the Melbourne-based group, which doesn’t reveal its funders but has run a long campaign of climate misinformation. But none of these are the “remarkable thing” I referred to earlier. While researching […] and during my academic studies, I have come across many references to the Club of Rome (CoR), and reports produced by them. Initially I assumed that they were just another high-level environmental think-tank and dismissed the conspiracy theories found on many website claiming that the CoR is a group of global elitists attempting to impose some kind of one world government. I am not a conspiratorial person by nature and was faced with a dilemma when I first read their reports. But it’s all there – in black and white. So what exactly is “The Green Agenda” which Delingpole tells his readers is offering this leading analysis? Here’s the source of the quote, on the website “The Green Agenda”. And who runs “The Green Agenda”? It is a sister site of The Watchman’s Post – which describes itself as a “Christian/ Messianic End Time Messenger!” based in New Zealand. That’s right. Delingpole’s “analysis” of a jumped-up conspiracy theory about plans for a one world government come direct from a group of Christian fundamentalists who preach about second comings and “end times”. The watchman’s website details the coming of an “anti-Christ”, “times of distress and tribulation” and “Triads of evil”. Perhaps it might be worth checking a few more of Delingpole’s sources in “Killing the earth to Save It” which is described by News Corp. columnist Andrew Bolt on the back cover as “wonderful” with “devastating facts and lacerating anecdotes”. Not just devastating and lacerating, but potentially world ending – apparently – just not in the way Bolt and Delingpole might have expected. Oh, did I say that Killing the World To Save It and Taxing Air are available in “all good bookshops”? This post was orginally published at DeSmogBlog. CANADIAN blogger and climate science sceptic Donna Laframboise has flown off for a tour of Australia to tell anyone willing to listen that the world’s foremost body on climate change, the United Nations’ Intergovernmental Panel on Climate Change, is something resembling a shambling mess. Laframboise’s trip has been organised by free market think tank the Institute of Public Affairs, which has a long history of promoting doubt about the science of human-caused climate change and the risks of the unmitigated burning of fossil fuels. Essentially the book makes three central claims. The first is that the IPCC has engaged several young scientists which Laframboise says goes against the IPCC’s claims that they use the world’s top scientists. A second is that some of the scientists working on some of the reports have links to environmental groups which are not always made clear. A third is that the IPCC reports use too much non-peer reviewed literature. All of these arguments are used as a proxy to question the science. Yet the IPCC’s main climate change reports (the latest being the 2007 Assessment Report 4, the next being AR5 currently being worked on by more than 800 authors and expected some time in late 2013 or early 2014) don’t actually do any science. They are reviews – albeit almighty ones – of research being conducted at institutions around the world and of scientific papers published in journals. This means that even if the IPCC was found to be run by a small group of mentally-challenged llamas, this wouldn’t affect the science on human-caused climate change. In essence, Laframboise’s book is one giant strawman argument. 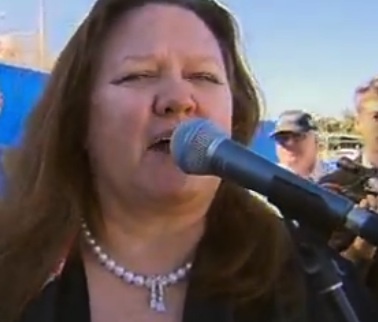 Does Gina Rinehart want to use Fairfax as a microphone? A version of this blog originally appeared on DeSmogBlog. SHE is the richest woman on the planet with a personal fortune approaching $30 billion thanks to her coal and iron ore businesses. But when it comes to arguably the planet’s most pressing problem – human-caused climate change – the Australian mining magnate Gina Rinehart dismisses out of hand not only the issue, but the expertise of the world’s climate science community. Now, Rinehart, the head and owner of Hancock Prospecting, has revealed that she wants to use her substantial stakes in two leading Australian media companies to be able to promote the views of climate science deniers. Earlier this week, the publicly-funded Australian Broadcasting Corporation’s investigative television documentary Four Corners looked at Ms Rinehart’s life story. Her climate science denial did not appear in the broadcast, but the ABC did ask her about it and has released the answers to a series of questions on the issue of climate change and her promotion of climate scepticism. The program comes as Rinehart is engaged in a very public fight with the board of Fairfax, the media company which owns the nation’s most respected newspapers the Sydney Morning Herald and The Age.